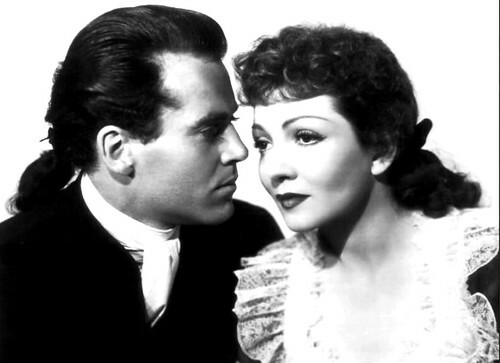 Henry Fonda and Claudette Colbert tame the frontier in Drums Along the Mohawk. The Stars: Henry Fonda, Claudette Colbert and Edna May Oliver. Source Material: The novel by Walter D. Edmonds. Gilbert (Henry Fonda) and Lana Martin (Claudette Colbert) on their wedding day in Drums Along the Mohawk. Awards: Nominated for two Academy Awards: Best Color Cinematography and Best Supporting Actress for Edna May Oliver. 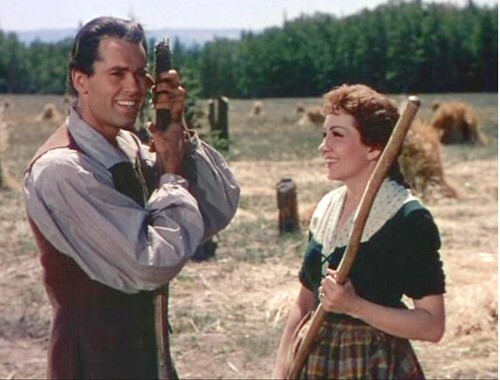 The Plot: Newlyweds Gilbert (Henry Fonda) and Lana Martin (Claudette Colbert) try to build a successful farm in the colonial frontier of Western New York while fending off attacks from Indians and the British. Henry Fonda and Claudette Colbert in a publicity still for Drums Along the Mohawk. Backstory: Film adaptations of historical fiction were quite popular in the late 1930s: Warner Brothers had Anthony Adverse (1937), MGM had Goodbye, Mr Chips (1939) and David O. Selznick had Gone With the Wind (1939). 20th Century Fox chief Darryl Zanuck bought the rights to Walter Edmonds' Revolutionary War novel about life in the frontier of New York's Mohawk Valley, but Drums Along the Mohawk had a rocky road to the silver screen. Zanuck did not like the early drafts of the script. Ironically, he thought there was too much "flag waving patriotism" in a film about America's fight for Independence. Casting was also a problem. Several actors, including Warner Baxter and Don Ameche, were linked to the lead role of Gilbert Martin. In the end, Zanuck chose Fonda and Ford because they worked so well together on Young Mr. Lincoln (1939). 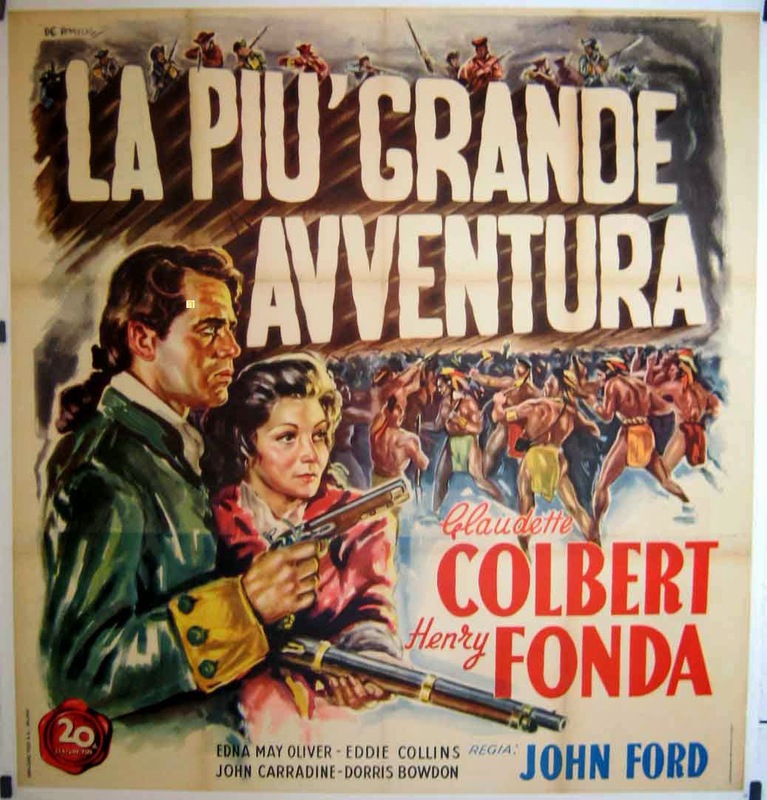 An Italian poster for Drums Along the Mohawk. The title means "The Grandest Adventure." Best Performance: Edna May Oliver as Mrs. McKlennar. Oliver played many a matriarch in her long acting career, but she is probably best remembered for playing the tough as nails widow, Mrs. McKlennar, in Drums Along the Mohawk. Oliver is more than mere comic relief, although she is frequently hilarious, and Oliver and Ward Bond are one of the great oddball romances in thirties cinema. 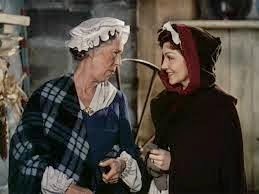 Instead, Ford, who had a way with older actresses -- see Jane Darwell in The Grapes of Wrath (1940) and Sara Allgood in How Green Was My Valley (1942) -- makes Mrs. McKlennar the embodiment of the pioneer spirit. Mrs. McKlennar is a rugged individualist who doesn't take any orders from the British or accept society's standards on acceptable behavior. Best scene: Gil heads off to join the Continental Army with a goodbye kiss from Mrs. McKlennar (clip below). Best Line: "Any man not reporting to duty will be promptly hanged, Amen," Reverend Rosenkrantz (Arthur Shields), getting right to the point during Sunday services. Location Shooting: Drums Along the Mohawk was filmed in Utah's Wasatch Mountains, which stood in for the picturesque Mohawk Valley. The beautiful scenery looks stunning in Technicolor, but the remote location near Cedar City, Utah, presented many logistical problems. Roads had to be made to even get the set. and once the production crew actually arrived at the location they had to build a fort and several frontier houses. 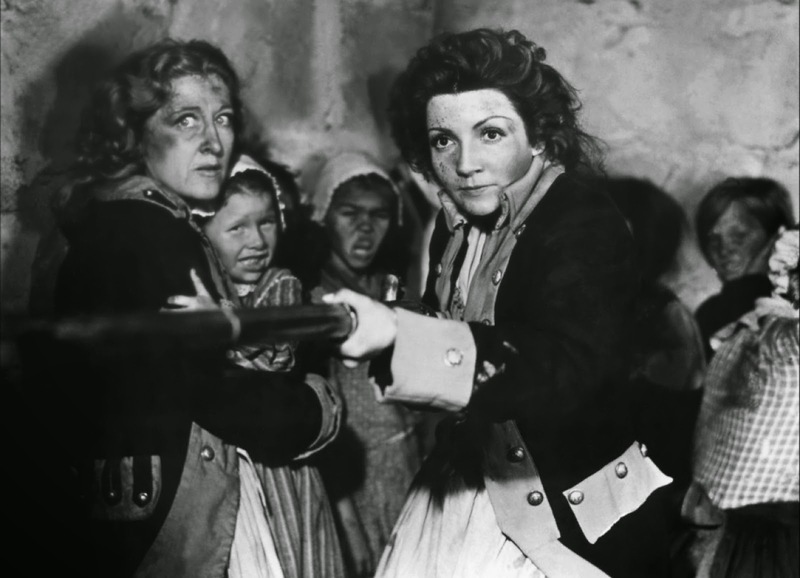 Claudette Colbert sets her sights on the British in Drums Along the Mohawk. Chief John Big Tree: One of the most memorable characters in Drums Along the Mohawk is Blue Black, an Oneida Indian with a penchant for hollering, "Hallelujah!" at inappropriate moments (Ward Bond shamelessly stole this shtick in The Searchers). Blue Black was played by Chief John Big Tree who was quite a colorful character in his one right. Big Tree, whose real name was Isaac Johnny John, was a member of the Seneca Nation. Big Tree appeared in many films, including the seminal Westerns, The Iron Horse (1924) and The Frontier Trail (1926). Big Tree was quite the raconteur and he told many stories about himself that may or may not be true. His most famous tale is that he was one of three models for the Indian Head nickel. Fun Fact: The props department couldn't find a plentiful supply of flintlock muskets in the United States, so they ordered them from Ethopia. Why it's essential: Drums Along the Mohawk is lesser Ford, but it's still a great action-adventure yarn with fine performances. The two leads are great, but the real heart of the film is in the rich supporting performances from Oliver and other members of the Ford stock company. Drums Along the Mohawk also stands out because it's one of the few films about Colonial America and the Revolutionary War. Availability: Drums Along the Mohawk is streaming on Amazon Prime. It is also available on DVD and video on demand. Next week, Ginger Rogers finds an abandoned baby on her doorstep in Bachelor Mother.